Brazil is the giant of the Latin American region. It is the world’s fifth largest nation in terms of area and population. Its landmass is far larger than Europe combined or the continental USA, and it is just a small matter of being 35-times larger in area than the entire United Kingdom. Brazil is not really a country, it is more of a continent and you can’t explore continents in just a couple of days, so do give yourself sufficient time when visiting to do Brazil the justice it deserves. Nine tenths of Brazil lies in the Tropics between the Equator and the Tropic of Capricorn. 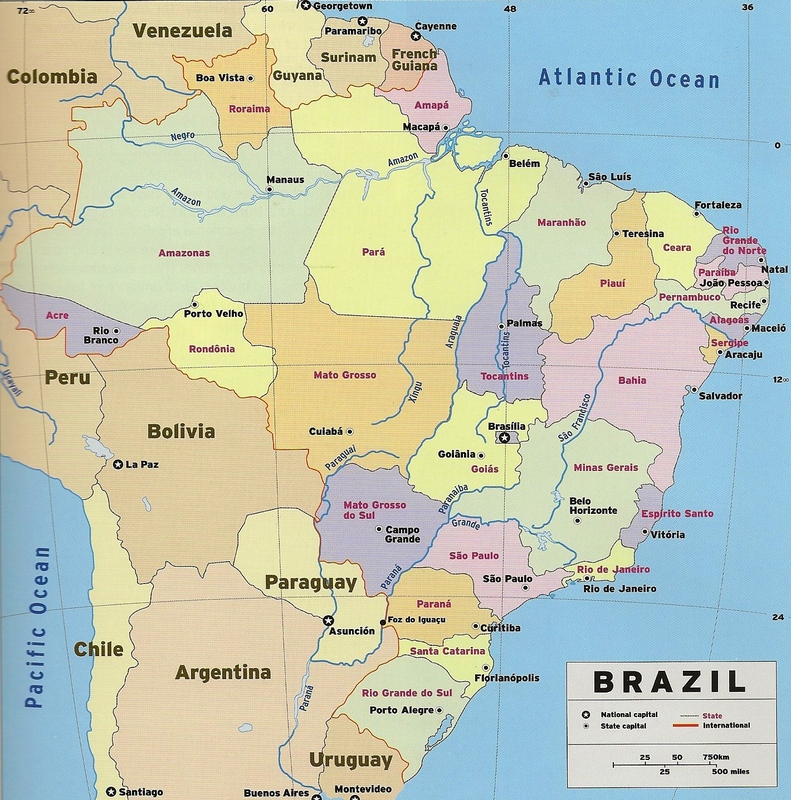 Covering over half of the continent of South America, Brazil borders every South American country apart from Ecuador and Chile. For Europeans the Brazilian story began over 500 years ago when on 22 April 1500 the Portuguese explorer, Pedro Álvares Cabral, landed close to what today is Porto Seguro in the state of Bahia. Cabral and his crew – who were greeted warmly by the native Amerindians – may have been the first European visitors, but many more have followed in their footsteps either to visit or to settle. Brazil currently has a population of approximately 210 million. There are 23 metropolitan areas in the country with a population of over one million, of which São Paulo is the largest with 21 million residents, and Rio de Janeiro second with just over 12 million. 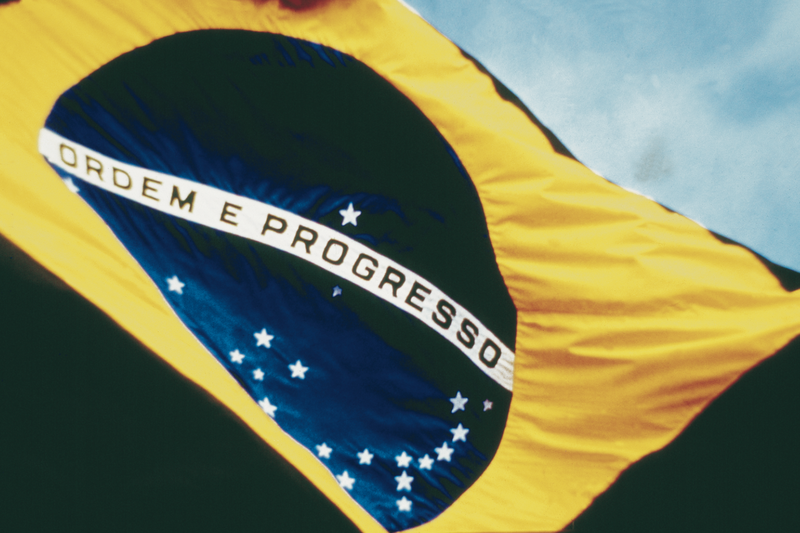 For business Brazil is one of the world’s largest and fastest growing economies and markets. The country is home to the world’s third largest stock exchange; it is one of the world’s top eight agricultural producers; it is the world’s largest exporter of coffee and the largest producer of sugar and orange juice; it is one of the world’s major steel producers and the sixth largest aluminium producer; it is the world’s largest producer of iron ore; it has the largest healthcare market in Latin America; Embraer is the world’s third largest commercial airline manufacturer; Brazilians are the largest consumers of luxury products in Latin America and the world’s eighth largest luxury goods market; the country is the seventh largest producer of vehicles in the world; and 45% of all the energy consumed in Brazil already comes from renewable sources, in part thanks to the world’s largest hydroelectric plant. The numbers are impressive and that is why so many international business executives find themselves on a plane to Brazil, a country that for many nations is their most important trading partner in Latin America. 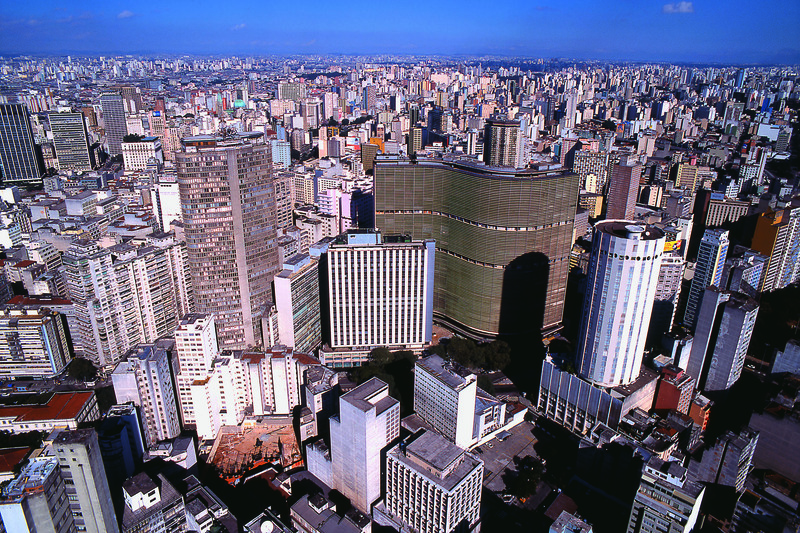 Latin America’s largest industrial and commercial centre, and often the gateway to Brazil through its modern international airport, is São Paulo. The city is known for being the economic engine that pulls the rest of the Brazilian economy behind it. São Paulo, you will also discover, is one of the world’s great cosmopolitan cities and is only not better known and respected due to the proximity of its somewhat more famous and infamous neighbour, Rio de Janeiro. 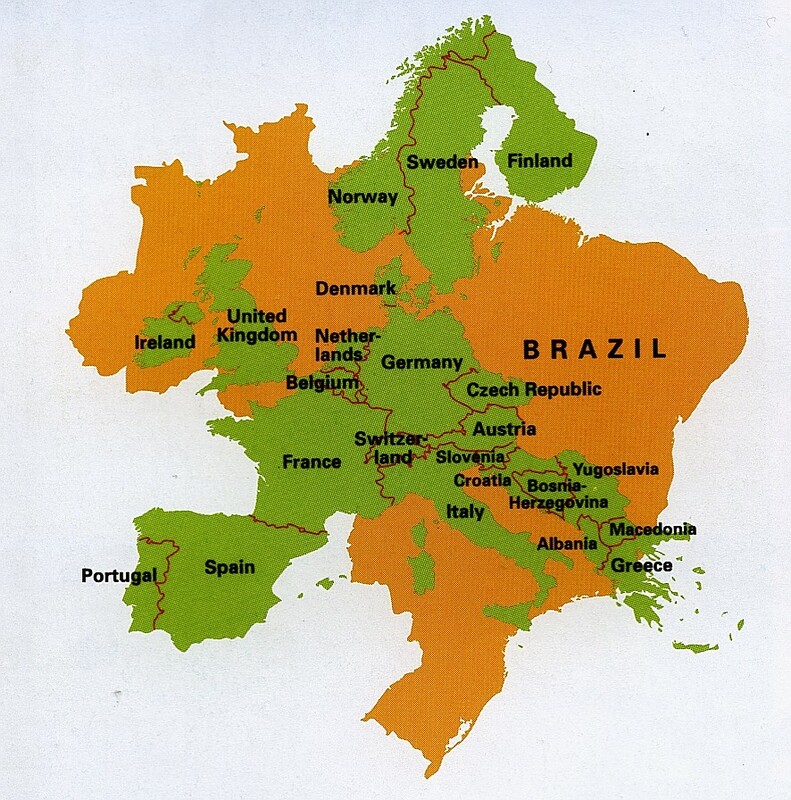 Europe to scale when placed over Brazil. Brazil, as many visitors have already discovered and will be happy to tell you, and was shown during the 2014 World Cup and 2016 Olympics, is much, much more than just Rio de Janeiro and São Paulo. It is a country of many hidden treasures and experiences waiting to be uncovered and discovered, and Rio is just the opening chapter. For a full guide to Brazil, check out our sister site Brazil the Guide. As well as being home to Rio de Janeiro and São Paulo, and nearly half of the Brazilian population, the southeast of Brazil is where the historic towns of Minas Gerais are to be found. A collection of towns and villages that make up one of mankind’s great colonial legacies, this in a country that is full of artistic and architectural masterpieces. 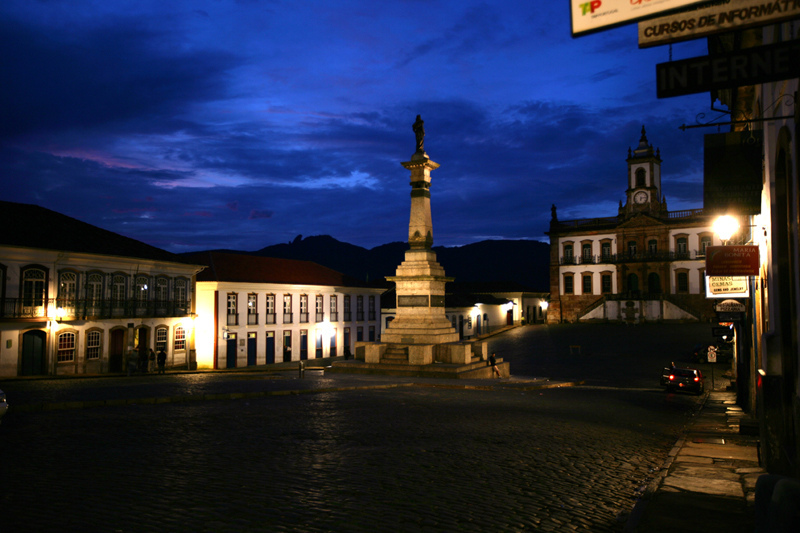 At last count, Brazil boasts no less than 19 UNESCO World Heritage Sites of which the towns of Ouro Preto and Diamantina, and the Sanctuary of Bom Jesus in Congonhas, are in Minas Gerais. Further to the south is a prosperous, sub-tropical region that has been influenced by the countless European immigrants who have flourished here over the centuries, helping to develop the great cities of Porto Alegre, Florianópolis, and Curitiba. It is the region that is responsible for Brazil’s fine wines and outstanding beef, as well as one of the world’s great natural wonders and most popular tourist sites in Latin America – the waterfalls at Foz do Iguaçu. It is also home to the exceptional beaches of Santa Catarina from where whale watching is growing in popularity; the majestic highlands of Rio Grande do Sul; and the Jesuit Missions. Five times larger than its North American cousin, Niagara, the 275 individual falls at Foz stretch nearly 1.8 miles (3 kms) across the Iguaçu River to Argentina. The main fall is the largest in the world in terms of volume of water per second and the entire national park is a UNESCO World Heritage Site. Away from the coast, in the geographical centre of South America, there is Brazil’s Central West that offers the striking contrast between the country’s futuristic capital, Brasília, a UNESCO World Heritage Site in its own right along with the historic centre of nearby Goias, and the Pantanal, Brazil’s own wild west that holds one of the largest and richest reserves of flora and fauna known to man. In the north the Pantanal links up and merges with the many undiscovered wonders of the Amazon, which has at its heart the man made oasis of Manaus. Once, during the rubber boom, one of the world’s richest and most cosmopolitan cities, today Manaus acts as a gateway for visitors looking to explore the Amazon rainforest. In 2014 it was one of the 12 host cities for the World Cup. Over 60% of the Amazon is located in Brazil, it is a rainforest that is responsible for generating over half of the planet’s oxygen while the river, which flows for over 4,200 miles (6,760 kms), pours enough fresh water into the Atlantic on a daily basis to supply the water needs of the UK for over two years. The Northeast of Brazil, with its mix of tropical beaches and culture, is the country’s very own holiday playground. 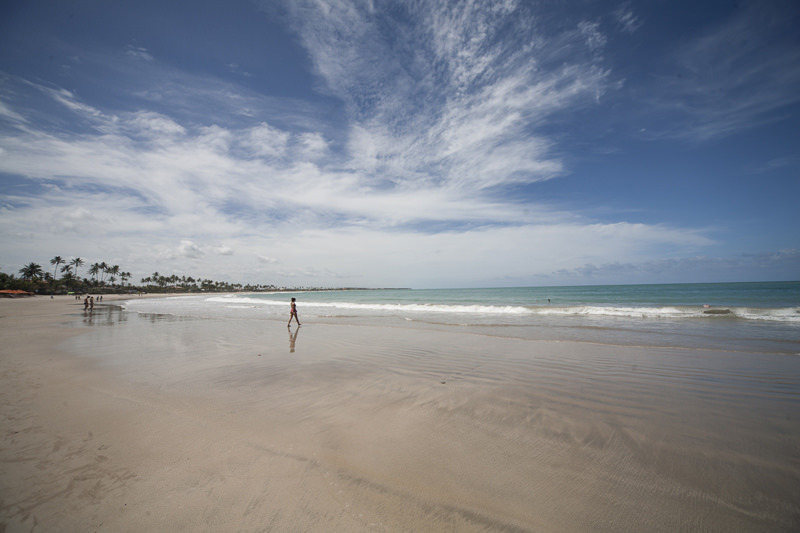 It spreads from Maranhão in the north to Bahia in the south, by way of such popular coastal destinations as São Luiz, Jericoacoara, Fortaleza, Natal, João Pessoa, Olinda, Recife, Porto de Galinhas, Maceió, Praia do Forte, Salvador, Morro de São Paulo, Trancoso and Itacaré. In total, Brazil offers its visitors more than 4,500 miles (7,250km) of warm, white beaches that go to make up part of the longest continuous coastline of any country in the world. UNESCO World Heritage Sites in the Northeast include the historic centres of Salvador, Olinda, São Luis, and São Cristóvão, as well as the Serra da Capivara National Park, the Atlantic Rainforest, and the ecological archipelago of Fernando de Noronha, a highly sought after dive site. In short, Brazil is a treasure trove of experiences, attractions, and locations just waiting to be unlocked by the discerning traveller.